It’s easy to be pessimistic about the future of liberty. Yet sometimes freedom advances with extraordinary speed. Like 25 years ago in Europe. As 1989 dawned communism had ruled what was the Russian Empire reborn for seven decades. The system failed to fulfill its promise of human liberation, but survived with the backing of secret police, gulags, and the Red Army. Then in an instant it all was swept away. On November 9, 1989, the Berlin Wall was open. One of the most dramatic symbols of human tyranny was gone. The Wall began as barbed wire, but turned into concrete walls with watch towers and anti-vehicle trenches. Tens of thousands of East Germans were imprisoned for “Republikflucht,” or attempting to flee the East German paradise. Some 1000 people died trying to escape East Germany, about 200 from Berlin. The first person murdered doing was a 24-year-old tailor, Guenter Litfin, shot and killed while swimming the River Spree. On February 6, 1989, 20-year-old Chris Gueffroy became the last East German to be murdered attempting to escape. As 1989 dawned there was obvious unrest in what Ronald Reagan had called the Evil Empire. Hope was rising, but no one could forget that previous popular demands for freedom always had been crushed by Soviet tanks. However, Mikhail Gorbachev had raised expectations within even the Soviet Union. In 1989 Hungary led the way. The man who betrayed the revolution three decades before, Janos Kadar, had been deposed. Soon plans were made for multiparty elections. The Communist Party dissolved. When the new leadership tore down Hungary’s wall with the West the Iron Curtain had a huge hole. Poland’s communist regime made a deal with a revived Solidarity Union and free elections were held. The liberal tide rose in Czechoslovakia, sweeping away the hardline leadership installed to squelch the Prague Spring of 1968. The East German regime remained tough. Frustrated East Germans began flooding into Prague, where they filled the grounds of the West German embassy, demanding passage to the West. Others went out through Hungary, with its open border. As protests spread the communist leadership temporized. On November 4 a million people gathered in East Berlin. On November 9 visibly struggling Politburo member Guenter Schabowski declared that East Germans would be free to travel to the West “immediately.” Border guards desperately sought guidance from above as tens of thousands of people gathered demanding to be let through. Just before midnight the security forces stood aside. The rest of the European communist dictatorships soon fell. These revolutions were mostly peaceful. But Romania capped the year with the Christmas Eve execution of Nicolae and Elena Ceausescu, the most odious members of Communism’s ruling menagerie. The transition from totalitarian communism to democratic capitalism turned out to be far more difficult than most anyone expected. But it is important not to forget how awful communism truly is. The Black Book of Communism figured the overall death toll to be more than 100 million. In Death By Government the late R.J. Rummel estimated the butcher’s bill to be nearly 160 million. In short, we should celebrate a quarter century after the collapse of communism. The events of 1989 represent a massive increase in liberty, a fantastic triumph of the human spirit. With so little bloodshed everyday people ousted a gaggle of tyrannies. They have given hope for future generations, and themselves, that freedom can emerge against seemingly impossible odds. There were many heroes in the battle for liberty. Particularly important were Mikhail Gorbachev and Ronald Reagan. The former ended the Soviet police state and kept the Red Army in its barracks as the Soviet satellites fell out of orbit. Ronald Reagan understood that communism was morally evil. 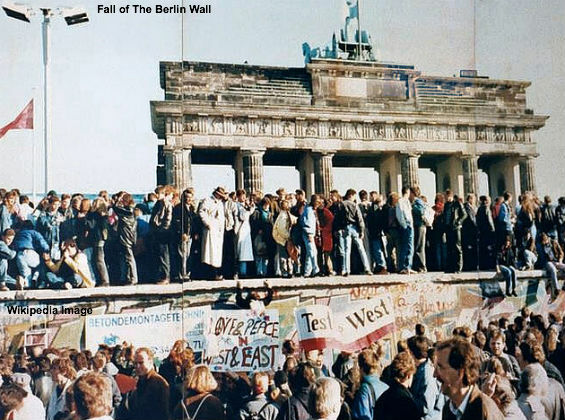 On June 12, 1987 he stood in front of the Brandenburg Gate and said: “General Secretary Gorbachev, if you seek peace, if you seek prosperity for the Soviet Union and Eastern Europe, if you seek liberalization: Come here to this gate! Mr. Gorbachev, open this gate! Mr. Gorbachev, tear down this wall!” But Reagan did something else equally important: he recognized that Gorbachev was different than previous Soviet leaders and would be willing to accept the opening of the Berlin Wall. There is much today to frustrate those who believe in liberty. The hopes of 1989 remain unfulfilled in Russia and many of the former Soviet republics. At home the government is more expensive, expansive, and intrusive. Yet we must not give up hope. May the same spirit of liberty remain strong among us.